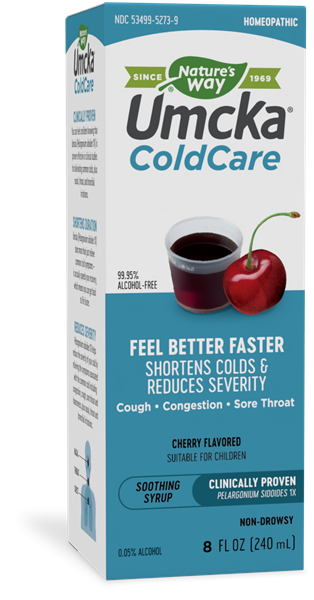 Umcka ColdCare Cherry Syrup / 8 oz - Nature's Way®. CLINICALLY PROVEN You can feel confident knowing that Umcka (Pelargonium sidoides 1X) is proven effective in clinical studies for alleviating common colds, plus nasal, throat, and bronchial irritations. REDUCES SEVERITY Pelargonium sidoides 1X helps reduce the severity of your cold by relieving the symptoms associated with the common cold including congestion, cough, sore throat and hoarseness, plus nasal, throat and bronchial irritations. Adults & children 12 years of age and older: Take 1 1/2 teaspoons (tsp) (7.5 mL) 3 times daily. Children 6-11 years of age: Take 1 teaspoon (5 mL) 3 times daily. Umcka® ColdCare chewables are clinically proven to shorten the duration and reduce the severity of common cold symptoms such as nasal & bronchial irritations, congestion, sore throat, and cough. And they taste great too!